Hereditary kidney disorders represent significant risk for the development of end stage renal desease (ESRD). Most of them are recognized in childhood, or prenataly particularly those phenotypicaly expressed as anomalies on ultrasound examination (US) during pregnancy. They represent almost 50% of all fetal malformations detected by US (1). Furthermore many of urinary tract malformations are associated with renal dysplasia which leeds to renal failure. Recent advances in molecular genetics have made a great impact on better understanding of underlying molecular mechanisms in different kidney and urinary tract disorders found in childhood or adults. Even some of clinical syndromes were not recognized earlier as genetic one. In monogenic kidney diseases gene mutations have been identified for Alport syndrome and thin basement membrane disease, autosomal dominant polycystic kidney disease, and tubular transporter disorders. There is evident progress in studies of polygenic renal disorders as glomerulopathies and diabetic nephropathy. The expanded knowledge on renal physiology and pathophysiology by analyzing the phenotypes caused by defected genes might gain to earlier diagnosis and provide new diagnostic and prognostic tool. The global increasing number of patients with ESRD urges the identification of molecular pathways involved in renal pathophysiology in order to serve as targets for either prevention or intervention. Molecular genetics nowadays possess significant tools that can be used to identify genes involved in renal disease including gene expression arrays, linkage analysis and association studies. Alport syndrome is a hereditary progressive nephropathy characterized by lamellation and splitting of glomerular basement membrane (GBM) and associated with sensorineural defect leading to hearing loss and ocular defects (2). It is recognized in early childhood by the hematuria and later progression to renal failure, predominantely in males before the age of six. In 85% families it was confirmed X-linked dominant inheritance. After years of recurrent or persistent hematuria, renal insufficiency is noted to occur, usually in the third or forth decade of life, occasionally before the age of twenty. Nephrotic syndrome may occurs in 30 - 40% of patients. Hearing loss is variable, ranging from complete deafness to high-frequency loss detected by audiometric exam. Associated abnormalities may include megalocornea, lenticlonus, spherophakia, myopia, retinitis pigmentosa, and macrothrombocytopenia. In females, the disorder is usually mild, with only microscopic hematuria, and does not typically progress to renal failure. The disease occurs at a gene frequency of 1/5000 and is transmitted in most families as X-linked dominant trait (2). The variety of mutations in COL4A5 gene is underlying cause (3) (Table 5.1.). The disease is closely connected to other, thin membrane disease, which is associated with COL4A3 and COL4A4 gene, members of gene families responsible for type IV collagen synthesis. Collagen type IV is a major component of basement membranes and different mutations are underlying defect in all Alport syndrome and related diseases. The term thin-basement � membrane nephropathy characterized by diffuse thining of GBM is often associated with urinary abnormalities and correspond not to a single clinical syndrome and should be differentiated from thickened GMB with split lamina densa as most characteristic ultrastructural lesion in Alport syndrome. The most prevalent hereditary kidney disease is autosomal dominant polycystic kidney disease (APKD) (1/400- 1/1000) individuals) caused by genetic changes of PKD1 gene located on chromosome 16 encoding membrane protein polycystin.The expression of PKD1 protein was licalized ti the tubular epithelium (podocytes). Polycystin protein contain a large extracellular adhesive component, a series of 13 membrane-spanning domains and at the C terminus a cytoplasmatic tait. The pathophysiological background of clinical symptoms is probably in the function of this protein. Polycystin is responsible for maintaining of renal epithelial differentiation and organization (4-6). Polycystin is involved in the signal conveying. The signal normaly conveyed from the polycystin legends in the extracellular space to the interior of cell is dirupted by mutations in PKD1 which probably leads to abnormal differentiation of tubular cells and cyst formation. Furthermore it was shown that PKD1 gene in some patients is contiguous to one of genes involved in other disease (TSC2 gene) named tuberous sclerosis (7). PKD2 gene is localized on chromosome 4 and PKD2 protein contain more restricted extracellular domain than PKD1 and the structure is compatible with one ion channel4. PKD 2 protein has six transmembrane spans but the N and C- terminal domains has aminoacid similarity with PKD1 protein. It was suggested that PKD2 protein belong to family of voltage-activated calcium and sodium channel and therefore it is speculated that both PKD1 and PKD2 proteins are involved in a common signal transduction pathway. The clinical manifestations of APKD as pain, bleeding, infection and stone have been known for decades. The most frequent complication is progressive renal failure which leads to end stege renal disease (ESRD) at age between 40-59. But the large deletions disrupting both PKD1 and TSC2 gene are responsible for early progression of APKD and ESRF in young children. The determinants of progression are both genetic and non-genetic (infections, comorbidity), the rate of progression is slower in PKD2 families, in females than in males, in whites than in black patients. Hypertension is an early complication leading to ventricular hypertrophy. The earlier clinical intervention might be of benefit for prevention of cardiovascular complications. Potential complications are additionally liver cysts, gastrointestinal manifestations, portal hypertension and fatal intracranial aneurism rupture. In comparison with autosomal dominant PKD where cysts arise from any tubular segment in autosomal recessive PKD (ARPKD) the renal cysts develop from collecting ducts. Beside renal involvement congenital liver fibrosis and portal hypertension were found in early life. Further cystic disease complex include juvenile nephronophthisis characterized by diffuse interstitial fibrosis with thickened and multilayered tubular basement membranes. The leading finding are medullar cysts. It is an autosomal recessive disease caused by gene located on chromosome 2 (8, 9). Beside APKD renal cysts sometimes may be found in other patients suffering from tuberous sclerosis (TSC) and von Hippel Lindau disease (VHL). Nephrogenic diabates insipidus as congenital form include X linked recessive and autosomal recessive types.The various mutations of gene ADHRV2 that encodes V2 ADH receptor in the collecting tubular cells (10). or heterozygous gene mutations encoding aquaporin-2, a water channel in the collecting tubule (11, 12) are major genetic background. Clinical symptoms are characterized by insensitivity of renal concentrating system to the effects of antidiuretic hormone arginine vasopressin (ADH). Other hereditary disorder of tubular transport system is Liddle's syndromcaused by gene mutations encoding of β and γ subunits of Na+ channels. Hypocalcemic alkalosis associated with hypocalcinuria and hypomagnesemia are biochemical characteristics of other tubular transporter disorder named Gitelman syndrome. Other three hereditary disorders of hypercalciuric nephrolithiasis (X-linked recessive nephrolithiasis, Dent' disease and X-linked phosphemic rickets) are caused by mutations in the same CLCN5 gene which encodes kidney Cl- channel (13). Laboratory findings are characterized by low-molecular weight proteinuria and hypercalciuria. Those disorders might participate in the pathogenesis of essential hypertension. Some of these disorders are complicated with nephrolithiasis. Cystinuria, autosomal recessive disorder, due to defect in dibasic tubular reabsorption liads to stone formation, Dent's disease and X-linked calcium nephrolithiasisare also characterized by proximal tubular dysfunction . Autosomal recessive Bartters syndrome is recently characterized as mutation of gene encoding for burnetanide/furosemide sensitive Na-K-2 C/co-transporter located in the apical membrane of ascending limb of Henleys loop (14). The inhibitory mutations of gene encoding for Na-Cl co-transporter inhibited by thiezide are found and this explains why this syndrome encompasses abnormalities reminiscent of long-term thiazide administration as well as low blood pressure. In the contrary activating mutations of these genes are accompanied with high blood pressure. (Liddle's syndrom). A number of inherited metabolic disorders have an significant impact on kidney function. Most promiments metabolic disorders with prominent glomerular involvment as Anderson-Fabry's disease, lecitin-cholesterol acyl transferase (LCAT) deficiency, genetic amyloidosis have been identified recently and diagnostic methods improved by new technologies (PCR in real time, microarray). Moreover the improvement of diagnostic methods for prominent extraglomerular metabolic diseases with renal involvment as for hyperoxaluria,uremic nephropathy,cysinosis, APRT deficiency and mitochondrial cytopathies brings to clinicians new potentials for earlier diagnosis and intervention as well. The association between glomerulonephritis and some genetic potential background were studied in recent years .An insertion/deletion polymorphism in intron 16 of angiotenzin-converting enzyme (ACE) gene studied in the number of patients with glomerulonephritis as well as other chronic disorders did not bring new data. The DD genotype on the contrary was found to be associated with rapid progression in IgA nephropathy. In addition IgA nephropathy patients with DD genotype respond to ACE inhibition therapy with lisinopril for decresing proteinuria (15, 16). The association studies concerning diabetic nephropathy gave contradictory results. Several studies have found an association between a trinuleotide repeats in exon 2 of the CNDP1 gene which encodes carnosine and diabetic nephropathy (17). The technologies developed for the Human Genome Project, the recent surge of available DNA sequences resulting from it and the increasing pace of gene discoveries and characterization have all contributed to new technical platforms that have enhanced the spectrum of disorders that can be diagnosed. The importance of determining the disease-causing mutation or the informativeness of linked genetic markers before embarking upon a DNA-based diagnosis is, however, still emphasized. Fluorescence in situ hybridization (FISH) technologies provide increased resolution for the elucidation of structural chromosome abnormalities that cannot be resolved by more conventional cytogenetic analyses, including microdeletion syndromes, cryptic or subtle duplications and translocations, complex rearrangements involving many chromosomes, and marker chromosomes (Figure 5.1. FISH technologies in molecular cytogenetic studies). Figure 5.1. FISH technologies for molecular cytogenetic studies. Interphase FISH and the quantitative fluorescence polymerase chain reaction are efficient tools for the rapid diagnosis of selected aneuploidies, the latter being considered to be most cost-effective if analyses are performed on a large scale. Interphase and metaphase FISH, either as a single probe analysis, or using multiple chromosome probes, can give reliable results in different clinical situations. It should be noted that there may be variation in probe signals both between slides (depending on age, quality, etc. of metaphase spreads) and within a slide. Where a deletion or a rearrangement is suspected, the signal on the normal chromosome is the best control of hybridisation efficiency and control probe additionaly provides an internal control for the efficiency of the FISH procedure. Depending on the sensitivity and specificity of the probe and on the number of cells scored, the possibility of mosaicism should be considered, and comments made where appropriate. By using locus-specific probes at least 5 cells should be scored to confirm or exclude an abnormality. In multiprobe analysis: three cells per probe should be scored to confirm a normal signal pattern. Where an abnormal pattern is detected, confirmation is advisable. 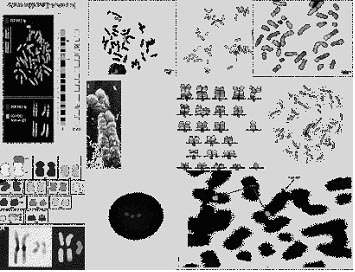 More recently new method for fast identification of chromosomal abnormalities has been developed as high resolution array comparative genomic hybridization (aCGH) which provide genome-wide analysis of chromosome copy number and structural change. DNA as analyte in genetic testing may be isolated from different biological material as peripheral blood, amnionic fluid, chorion villi, or maternal blood as free DNA. Todays techniques for gene mutation analysis are in general modification of polymerase chain reaction (PCR) technique where small quantity of DNA �in vitro� is multiplicated by under the activity of specific enzyme, the presence of primers and nucleotide mixture. The quantity of DNA obtained �in vitro� allow further the aplication of other analytical technologies for detection of mutation, deletion or other changes. Single strand conformation polymorphism (SSCP) method is used for detection of small mutations of gene and still is the most convenient method for detection of mutations of particular exons, as step before confirmation of mutation by sequencing. PCR in real time combine PCR and automatic multicolor fluorescence analysis of mutations and deletions allow fast analysis of number of DNA samples (18). Sequencing of DNA molecule allow determination of subsequent nucleotide A(denin), T(imin), G(uanin) and C(itozin) sequence. Multicolor, multichanell automatic sequencing with fluorescence emission developed in last five years made this procedure fast, efficient and safe. The high throughput microarray technologies combined with robotics are the newest development in molecular genetic testing. The application of this technology and its different modifications allowed to analyze whole gene or more genes simultaneously which bring to clinicians new tool for rapid and safe diagnostic procedures (18). The advances in automation of analytical procedures and fast growing of test number bring to analyst the need for broad external quality assessment by certified proficiency testing bodies. In general, every laboratory which delivers test results for prenatal care should be recognized by certified referral laboratory for each test performed in this laboratory. Gene expression array is used for profile gene expression. The advantage of this technique is that it enables innovative study design such as integration with other techniques and comparison between tissues or cell types (19). Linkage analysis is recommended for identification of a gene or genetic region that has large effect on phenotype. It allows the causal relationship between genotype and phenotype. The limitation is that it requires rare families for evaluation of results (19). The association analysis enables to identify common susceptibility variants underlying the disease and is suitable for study of complex diseases. Nevertheless it requires large cohorts, higher costs and clinical significance of association is unknown. Genome-wide association study is recommended for the study of genetic factors that influence common, complex diseases with high throughput covering whole genome. The large number of participants is needed for genes that have not very strong influence. Pirson Y, Chaveau D, Grunfeld JF. Autosomal dominant polycystic kidney disease. In Oxford Textbook of Clinical Nephrology. Davison A.M. et aled., 2nd Ed 1997; Oxford University Press. Gregory MC, Atkin CL. Alport Syndrome. In Disease of the Kidney. Schrier RW and Guttschalk CW (8 ed. ), Little, Brown 1993;pp571. Tryggvason K. Mutations in type IV collagen genes and Alpert phenotypes. Molecular pathophysiology and Genetics of Alpert Syndrome. Contrib. Nephrol 1996;117:154. Saito A, Sakatsume M, Yamazaki H, Ogata F, Arakawa M. A deletion mutation in the 3?end and of a5(IV) collagen gene in juvenile-onset Alport syndrome. J.Am Soc Nephrol 1994;4:1649. Kawai S, Nomura S, Harano T,Fukushima T, Osawa G. The Japanese Alport Network. The Col 4A5 gene in Japanese Alport syndrome patients. Spectrum mutations of all exons. Kidney Int 1996;49:814. Ward CJ, Tirley H, Ong ACM, et al. Polycystin, the polycystic kidney disease 1 protein is expressed by epithelial cells in fetal, adult and polycystic kidney. Proc Natl Acad Sci 1996.;93:1524. Brook-Carter PT, Peral B, Ward CJ, et al. Deletion of the TSC2 and PKD1 genes associated with severe infantile polycystic kidney disease: A continuous gene syndrome. Nat Genet 1994;8:28-32. Konrad M, Saunier S, Heidet L, et al. Large homozygous deletions of 2q13 region are the major cause of juvenile nephronophtisis. Hum Mol Genet 1996;5:367-71. Antignac C, Arduy CH, Beckman JS, et al. A gene for familial juvenile nephronophtysis maps to chromosome 2p. Nat genet 1993;3:342-45. Rosenthal W, Seibold A, Antaramian A, et al. Molecular identification of the gene responsible for congenital nephrogenic diabetes insipidus. Nature 1992;359:233. Deen PMT, Verdijk MAJ, Knoers NVAM, et al.Requirement of human renal water channel aquaporin-2 for vasopressin-dependent concentration of urine. Science 1994;264:92. Fushimi K, Uchida S, Hara Y, Marumo F, Sasaki S. Cloning and expression of atypical membrane water channel of rat kidney collecting tubule. Nature 1993;361:549. Lloyd SE, Pearce SHS, Fisher SE, et al. A common molecular basis from three inherited kidney stone diseases. Nature 1996;379:445. Harden, PN, Geddes C, Rowe PA, et al.Polymorphisms in angiotensin-converting enzyme gene and progression of IgA nephropathy. Lancet 1995;345:1540. Oudit GY, et al.Loss of angiotensin-converting enzyme 2 leads to the late development of angiotensinII dependent glomerulosclerosis. Am J Pathol 2006;168:822-8. Janssen B, et al.Carnosine as a protective factor in diabetic nephropathy: association with elucine repeat of carnosinase gene CNDP1. Diabetes 2005;56:2325-32. Elles R. Molecular diagnosis of genetic diseases. Humana Press. Totowa, New Jersey, 2000. Borst MH, Benigni A, Remuzzi, G. Primer: strategies for identifying genes involved in renal disease. Nature Clinical Practice Nephrology 2008;4:266-76.